Makes the Magelight and Candlelight spells cast a warmer, less blue light. DO NOT USE THIS FILE. 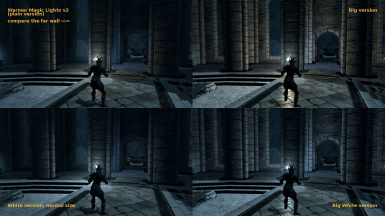 Get Sharlikran's fixed version here: http://www.nexusmods.com/skyrim/mods/26230/? Even though it's called a "patch", you don't need the original. You should have exactly ONE warmer magic lights esp checked. My original version no longer works because it was made before the official mod tools were released, and later mandatory patches have broken many mods like that. I will not be updating this mod, because I only released it as a convenience since pre-TESCK modding was pretty technical. With the official tools long-since released, this is a three-minute mod. Feel free to make your own version with your favorite color and the exact right brightness to compliment your favorite lighting mods. Does what it says. Magelight and Candlelight are now warmer. There are two sets of .esp options: orange/tan or pure white, and original size or triple size. 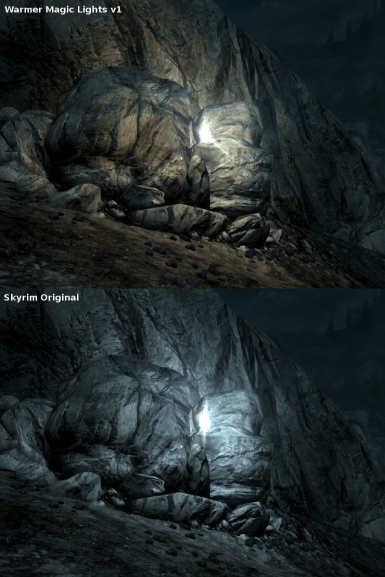 Though anyone can use them, the triple-sized "big" versions are meant to go with mods that make Skyrim darker. 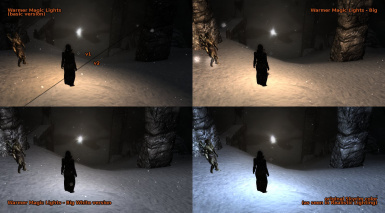 The normal versions (the ones that don't say "big") are the same size and about the same brightness as the spells were in vanilla Skyrim. That makes four versions. You should pick ONE and have exactly ONE of these .esps checked. If you use more than one, the one lowest on you modlist will just "win" and Skyrim will ignore the rest. 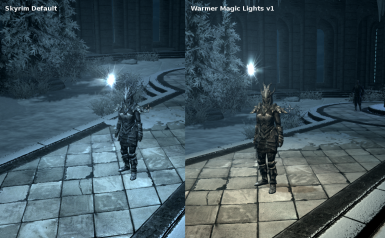 A special note for people using this with dark lighting mods: you need to make sure this loads AFTER mods like "Bright Lights" or "Realistic Lighting - Full". If you get that backwards then you won't see the warmer lights. If you have that problem, you will need a mod manager or tool like Wrye Bash or BOSS in order to change your load order. I would just ignore the meshes/textures download since it doesn't really change much, however, it should still work since there's no .esp in that. It was meant to make the glowing special effects ball of light look less blue, but had very little effect anyway.